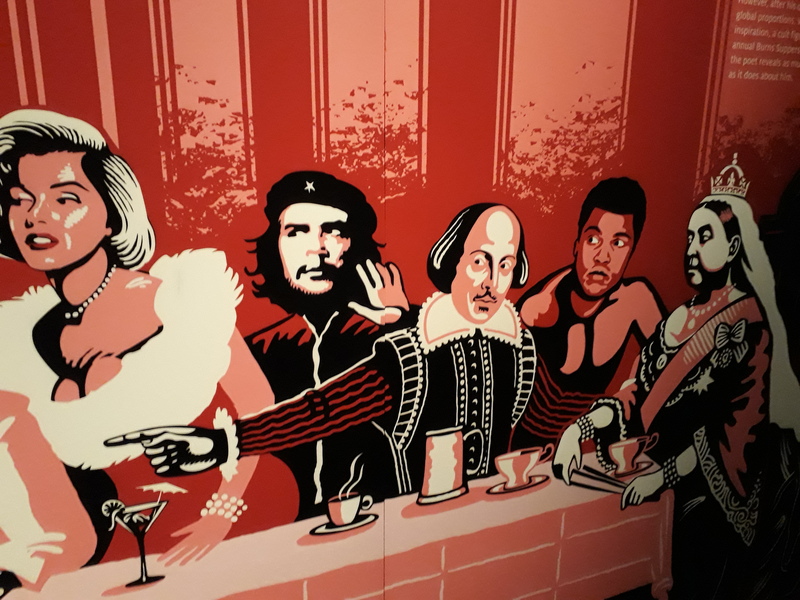 This iconic and vivid red poster definitely catches the een, however, at first glance you think you see the famous revolutionary Che Guevara in the Andy Warhol like pop art print – but, naw readers you’d be mistaken – its Robbie! 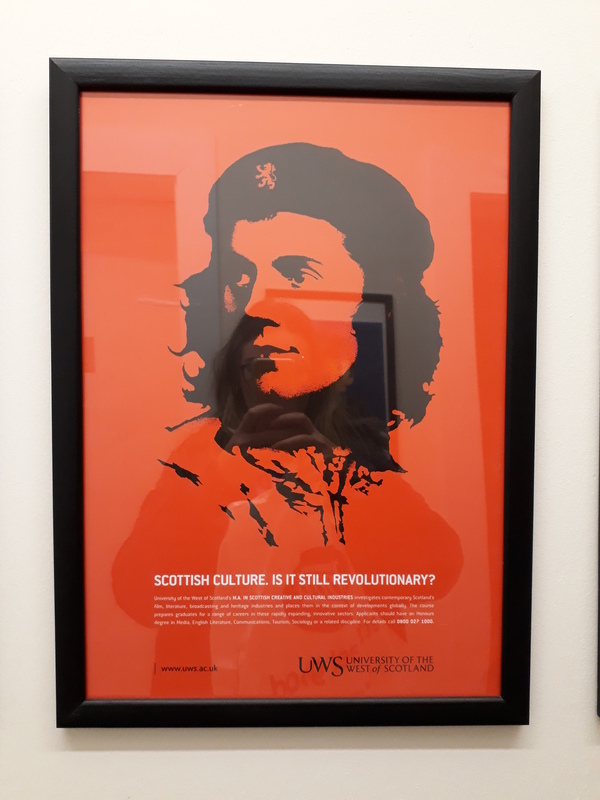 Cleverly the University of West of Scotland have mischievously replaced Guevara’s face with Burns’s to stand as Scotland’s most well-known and well-loved revolutionary. The posters purpose is to recruit students to study Scottish culture, and who best to represent that, than the greatest Scottish bard of all time. Popular culture ideas and images of Burns in the twenty-first century have made him a national favourite and his mug is surely recognizable by any true Scot. I mean he’s even got a national day after him (which outshines St Andrew’s day in Scotland!) 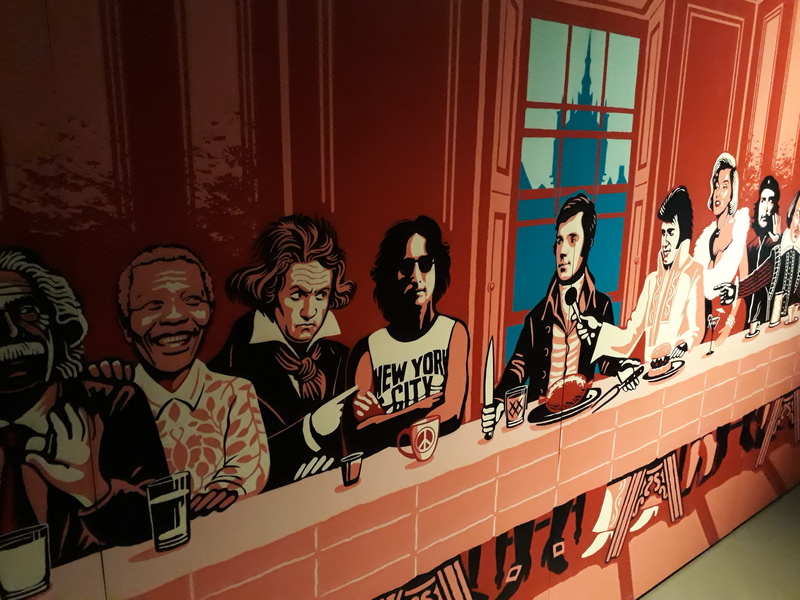 An example of just how famous Burns is thought to be is conveyed in the pop art featured in the exhibition space of the RBBM. Burns is seated at a dinner table next to the likes of Nelson Mandela, Elvis Presley, Marilyn Munroe and Mohammed Ali like a modern-day Jesus Christ hosting a Last Supper… all these celebrities are renowned for being extraordinary individuals and for revolutionizing their individual fields. But was Robert Burns revolutionary? I wid argue, that through his works, he wis aye. The poems Scots Wha Hae, A Man’s a Man for a’ That and The Rights of Woman all are inherently radical based on their political subjects and they are full of powerful, and sometimes emotive, language. Let us do – or die!! Tyrannical government was the object of American and European reformers and “liberty” was a 17th and 18th-century watchword. Burns may not have been bodily present or involved in revolutionary activities but he was there in spirit and mind. His works are deeply imbedded with hope for change. All in all, Burns has become the personification of Scottish identity and is a legend as his works and life are continued to be studied, celebrated and preserved the world over, hundreds of years after his death… If that doesnae make ye radical, then a dinny ken wit does. This entry was posted in Exhibition, Object Focus, Robert Burns and tagged advertising, Art, history, Inspiration, learning, modern history, museum, Object Focus, pop culture, radical, revolutionary, Robert Burns, Robert Burns Birthplace Museum, Scotland, Scots, Scots language.